First, spicy braised cabbage. 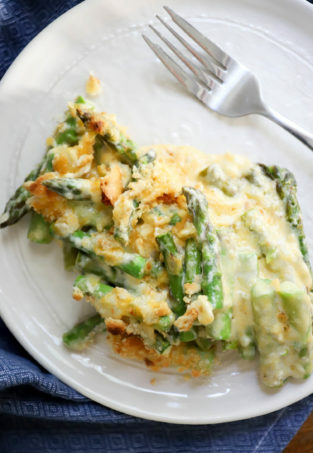 It’s easy and delicious! 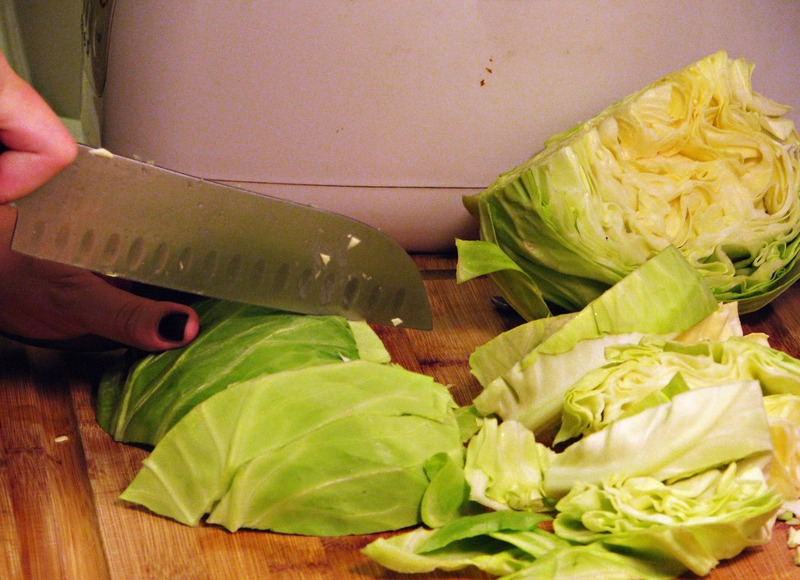 Cut the cabbage into large strips, and discard the core. One medium cabbage will serve 4 people with leftovers. 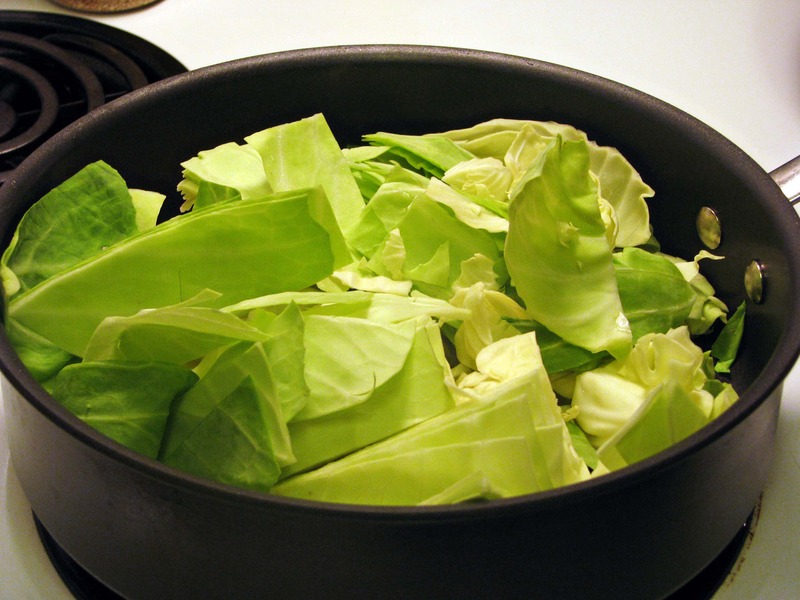 Heat a pan to medium, and add the cabbage to the pan with a drizzle of olive oil or cooking spray – don’t add more fat than you need to! 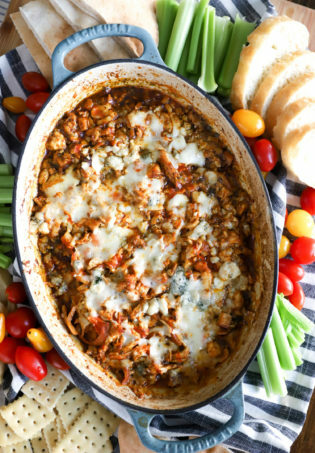 Cabbage cooks down a LOT, so use more than you think you’ll need! Toss the cabbage around the pan for 2 minutes using tongs or a big spoon, then drizzle in about 1 cup of chicken broth or stock and turn the heat down to medium or medium low – the liquid should be barely bubbling. These are easy ingredients! Honey, chili/garlic sauce, soy sauce, and mirin. 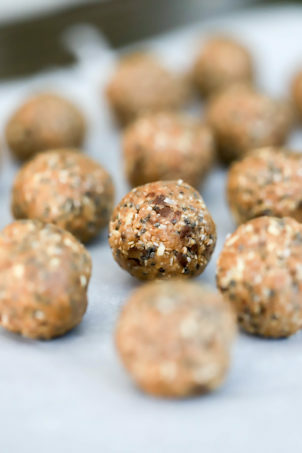 Mirin is a sweet cooking seasoning (in case you can’t read), and it acts sort of like wine – it’s easy to find in lots of grocery stores, so keep some around! 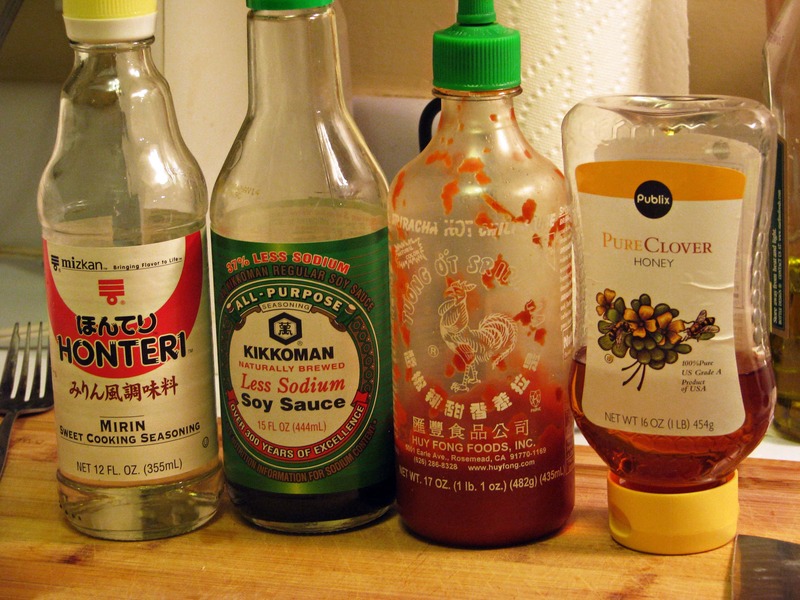 It really makes Asian things taste….Asian. 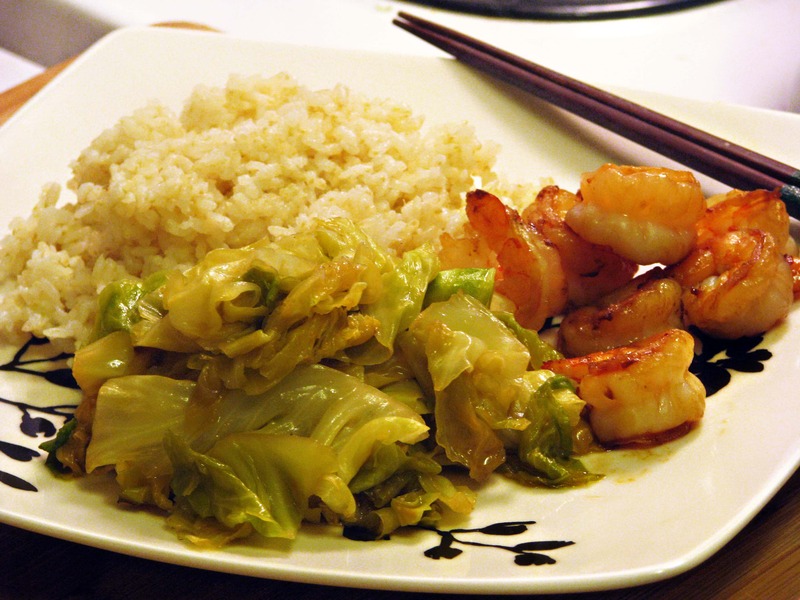 This makes the cabbage spicy, so use less chili sauce first if you’re unsure! 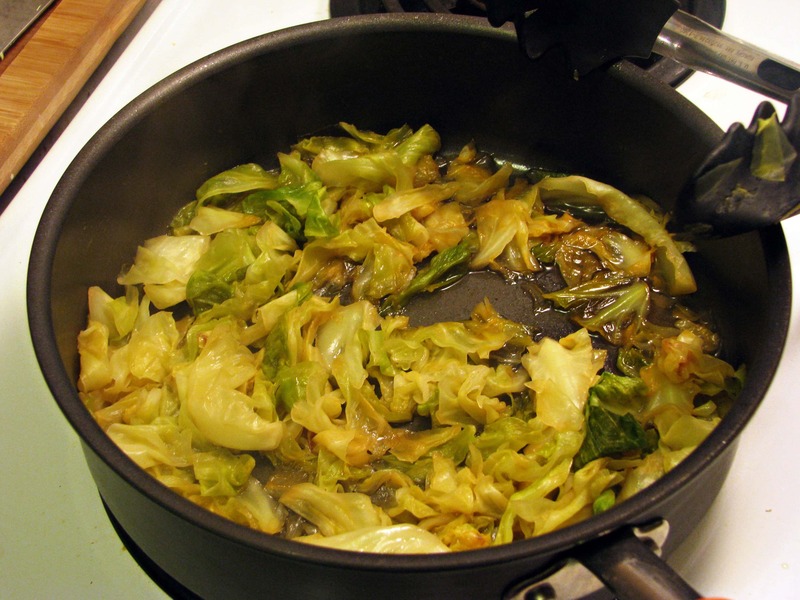 Toss the cabbage around and continue to let it braise until most of the liquid has evaporated, about 10 minutes more. Look how delicious that looks! 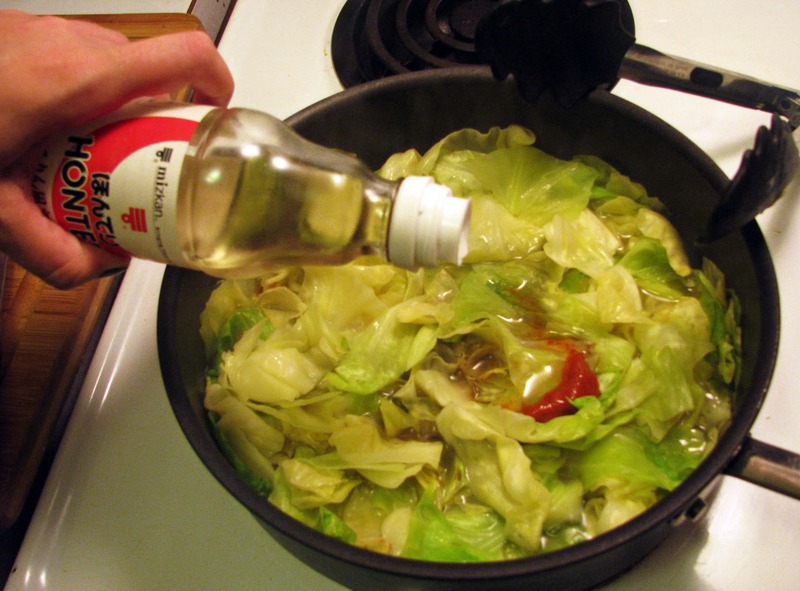 Taste the cabbage and add any more seasonings you’d like – turn the heat up right at the end to evaporate most of the liquid and let the cabbage get a little crispy on the edges. 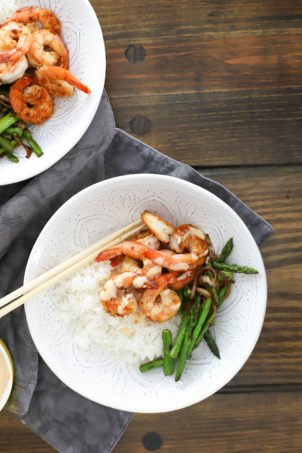 I served this with white rice and hibachi shrimp, which I’ll show you tomorrow – it’s easy and healthy too! Preheat a pan to medium heat with the oil. 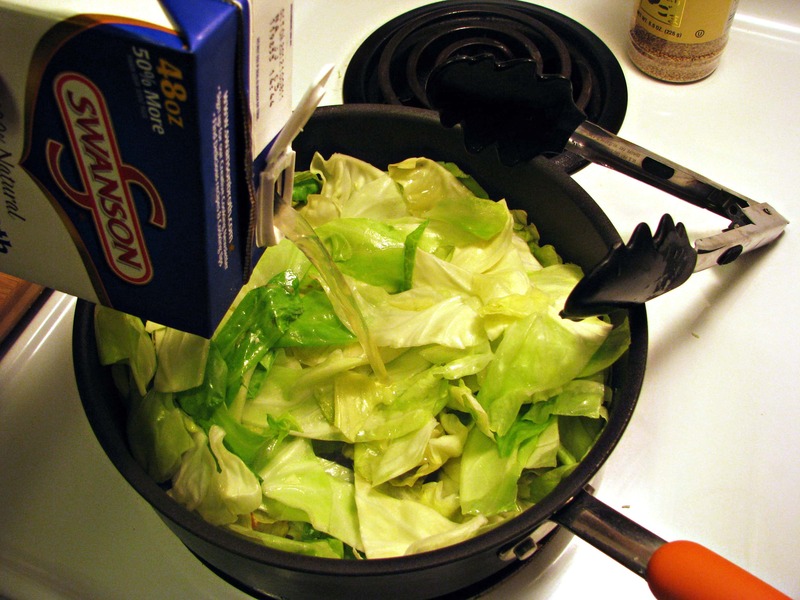 Add the cabbage, and let cook out for 2 minutes or two, tossing with tongs. Add the chicken stock and let braise as the stock and cabbage cook together for 5 - 10 minutes. When the stock is nearly gone, add the honey, soy sauce, mirin, and as much srirach as you'd like to the pan. Toss with tongs to form a sauce. When the stock is evaporated and the cabbage is cooked through, serve as desired. I really like your blog! The shrimp pictures are yummy!!! Merci! 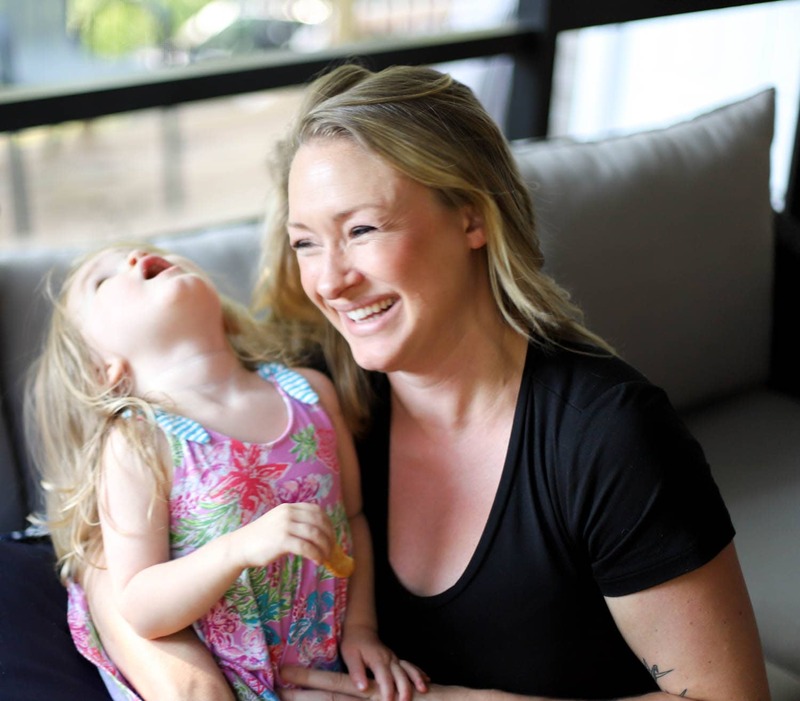 We love writing it – happy cooking! Great tip, bob! Putting a lid on the cabbage definitely speeds things up when braising, otherwise it can take forever sometimes! Glad you liked everything!